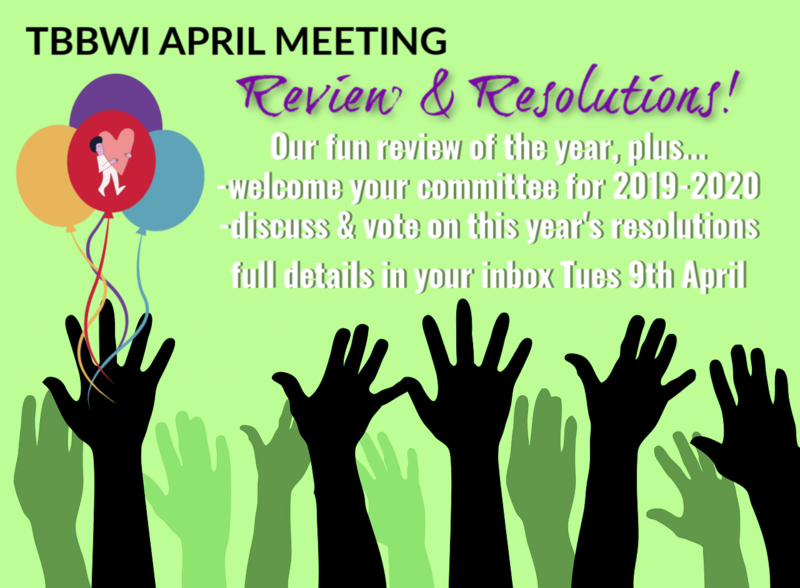 Come along to our April meeting to hear our review of the year and also welcome our new committee for 2019-2020. There will be the opportunity to discuss and vote on this year’s resolutions. Please remember that this month’s meeting will take place at The Bardswell Social Club – we look forward to seeing you there! March Saw the Return of Viv’s Quiz! We all enjoyed Viv’s topical quiz which drew inspiration from speakers we had listened to over the past year. Well done to Table Three who were victorious! Thank you again to Viv for organising and to Liz S. for collating all of the scores. The Belles were challenged to create a photograph of an everyday object from an unusual angle. There was an array of interesting and creative shots. Congratulations to Nicola who brought a whole new perspective to the iconic teapot! Lastly but by now means least, there was a very impressive collection of donated Easter Eggs and tinned meat. We have since heard from the Food Bank that we donated a whopping 51.55kgs of food from our tinned meat donations! 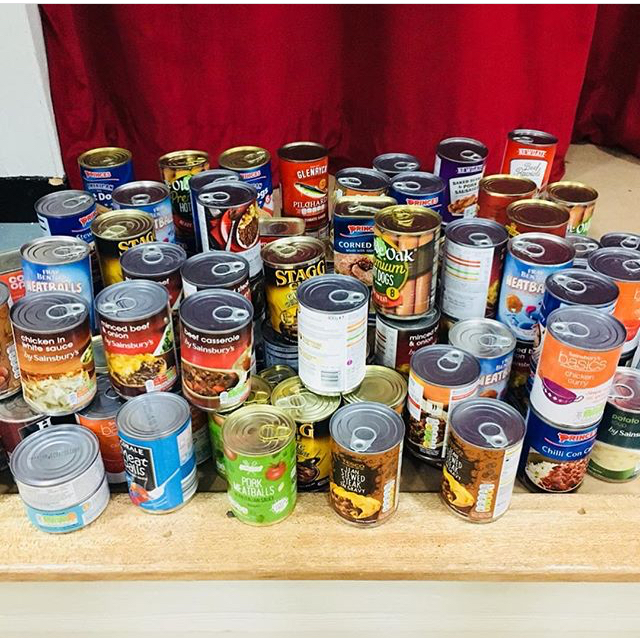 Tinned meat was desperately needed and this will go on to feed lots of families in need. Thank you for yet again rising to the challenge! February Got A Little Bit Romantic! This month we were joined by historical novelist Virginia Heath who talked to us about The Glorious 1800s. The first Challenge Cup of the new cup year was for Best First Sentence To A Romantic Novel and we presented the Challenge Cup for last year to Elizabeth Ross. Congratulations! We Started Our Year With A Clear Out! We started 2019 in style with Channel 4’s fabulous Declutter Divas, Alison and Zoe. They talked to us about how to declutter, as well as telling us about their own experiences. The Challenge Cup this month was for Healthy Cakes and wow did we have a great selection, thank you Belles! A Very Retro December Meeting! November Was Time To Get Christmasy! It’s Buzzing At The Belles! Full details of the speaker are in your inboxes but the theme is forensics. So with that in mind, we have a humzinger of a challenge cup for you. We’d like you to design your very own Wanted Poster! We will also be gearing from the new local FB group, Do Good In Brentwood about what their aims are and how we can support the initiative. We look forward to seeing you all there. We had a great time in September learning all about bees from Pauline including some unmentionable previously unknown facts! Some stunning poems from members (watch out for a feature on these shortly) was followed by hearing from some of the ladies who have completed challenges for our 100 Centenary Challenges – Miriam, Sandra, Nina and Sue. From yarn bombing a tree at the theatre, to the wonderful garden party at Liz’s house to our inaugural mega darts social with other WI teams… it’s been a busy summer for the Belles. Catch up with the full details on Facebook (click the FB icon below to go straight to our page). We had an epic Equalitea with the lovely Zoe Hudson and some unbelievably good spoon dolls! Well done ladies and have a great summer! It was a fabulous meeting with Sarah from 4160Tuesdays in June. Which scent was your favourite?! And we’ve managed to complete 85 of our 100 challenges! We’d love to finish the final 15 before our July meeting, so if you haven’t already done a challenge, please have a think about whether there’s something you could do this next month. It doesn’t have to be anything dramatic, just something which is a challenge or a milestone for your personally. And just look at the completely awesome Wall of Fame! This week is promising to be a fabulously seasonal meeting – we not only have a brilliant speaker from The National Gardens Scheme, but we also have Marion’s Annual Plant Swap – a truly great place to pick up some seedlings or cuttings to enhance your garden. And then there is our fabulously themed Challenge Cup! Enjoy, Belles! An awesome and busy meeting! We had our AGM and selected our President and Committee for the year. Jane stayed as President, Liz as Vice President , Tricia as Secretary and Viv as Treasurer. We heard about what a fun and busy year it has been and gave a big thank you to the members for taking part in all our activities. 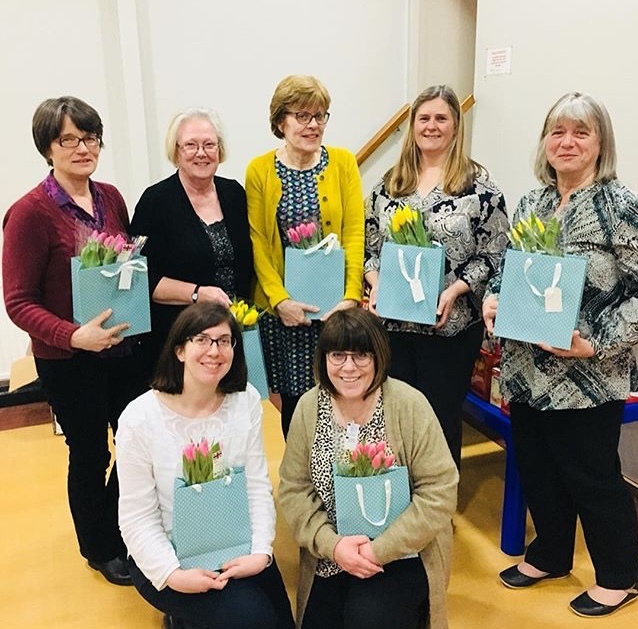 We also thanked the committee and, in particular, Carol and Marion who are stepping down from organising our amazing trips – big shoes for Sue adn Teri to fill but we have every confidence that they will manage it. At break we had another round of our Pudding Club and wow what an amazing selection of puddings there were, with many of your having 3 or 4 tasters! Hardly any pudding was left at the end so a huge thank you to all who took part. We also voted to agree with the resolution Mental Health Matters and heard some very personal tales from Jane and other members too, which helped solidify our opinion and resulted in an unanimous vote. Fianlly, Membership Secretary Margaret, won the Sadie Jones Challenge Cup for the year! Congratulations Margaret – she was the only Belle to enter every single competition and it helped lead her to victory! So scores now revert to zero and it’s game on for us all! We had a great time with John from Cribbs at our March meeting. We heard about the history of T. Cribbs and Sons and also how their work has significantly expanded into Ghana. The Belles also made some amazing badges for John to judge – we even had to whittle it down to a final 16 for him! Well done to all the ladies that took part – so much effort all round – it was brilliant to see. Please be aware that our info@ email address is experiencing problems and may have been since the beginning of the year. Please instead contact us either via Facebook Messenger https://www.facebook.com/thebrentwoodbelleswi/ or using the president@ or members@ or secretary@ email addresses instead. We are working with our providers to fix this as soon as possible. In February, we shall be welcoming local business Raspberry Interior Design, who will be telling us all about various aspects of interior design as well as getting us hands on with a few things! 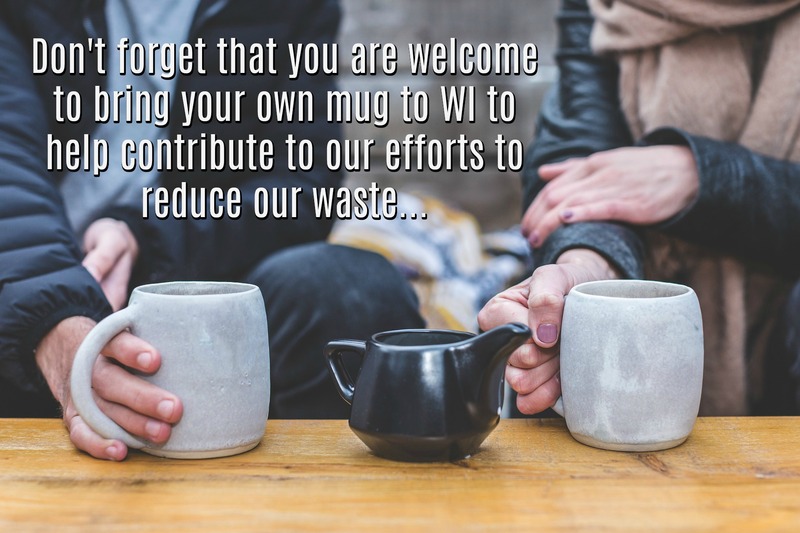 The Challenge Cup is appropriately ‘Early Signs of Spring’ and our swap table will be decorative household items you have no more need for, for example, vases, ornaments, lamps, throws, cushions etc. Our weekend Brunch Club was back this month and met at the Toby Carvery at Shenfield Common. We had a great meal including breakfast themed Yorkshire puddings! A group of 10 Belles are lived it up in Prague for a few days as part of the ongoing adventures abroad of our new Belles Abroad group. Having successfully survived Amsterdam, they went further afield to Prague this time. Reports included cocktail drinking, goulash eating and boat trips! We started the year with a bit of a boogie! We rocked our socks off line dancing to some rock ‘n’ roll music with Sam and it was great fun! And brilliant to see so many Belles up and giving it their all. Apparently we are super good at it too! Our Challenge Cup was for the best 50s inspired outfit and there were plenty of those around. Plus we had an unwanted gifts swap table and our usual book swap too, not to mention us all voting on the resolution choices for this year. We had a fabulous time in December being entertained by singer and eXtra Factor judge, Joe Fryd. The Belles had a wonderful time dancing the night away helped along by a stupendous buffet and some awesome prosecco cocktails! We definitely know how to party! In November we had a welcome return to our round robin style evening where you have the chance to try your hand at lots of quick and easy ways you can make your Christmas even easier, including stylish gift wrapping and quick decorations anyone can make. There’ll also be a small Christmas market of stalls run by members who have their own businesses, so you can pick up some early Christmas shopping too. Finally, it’s also the month of our refuge Christmas present collection. We had a brilliant evening with Viv’s Infamous Quiz! It was a great laugh and a huge well done to the winning team (pictured below)! We had a great evening with the Essex Blood Runners telling us all about how they work and what they do – amazing stuff and really interesting to hear their stories. We also had our fake injury Challenge Cup and our rather fabulous Produce Swap, not to mention our Book Bonanza table! Really good! Really good! Yay! Laughter yoga was most excellent fun! What a great way to kick off the summer! We had an awesome time in May with our visitors, Sister Philomena and Rev’d Sue talking about being Prison Chaplins – its was moving, horrifying and down right funny at times too. Such incredible ladies, who do an amazing job. Our 3rd Annual Plant Swap was well populated, and our decorated plant pot Challenge Cup went down well. Congratulations to Nic, who won the fabulous £400 Denman Bursary Draw. We were busy this month! We held our Annual Meeting and decided on our committee and President for the following year. Newbies to the committee this year are Nicola Hatch-Lighterness and Annette De Georgio. Our President Jane, was re-elected for 2017-18. Our Vice President, Liz, Secretary, Tricia and Treasurer, Viv, all agreed to stay on in their current roles. Jane and Tricia gave reports of the year including a show of various photographs demonstrating what a busy and varied year we have had. Jane thanked all those involved, whethe rn the committee or not, for their ongoing support, and all members for their enthusiasm. We also voted on whether we agree or not with one or both of the proposed resolutions for campaigning nationally over the next year, Alleviating Loneliness and Plastic Soup. Our Vice President, Liz, presented the cases for and against with Alleviating Loneliness and some discussion followed. It was voted ‘for’ almost unanimously. Our President, Jane, then presented the cases for and against Plastic Soup. There was quite some discussion afterwards and the vote for this one was more split with many more abstentions too. The vote was ‘for’ as well ultimately. And we also launched our amazing 100 Challenges for the Essex Centenary with Breda, Colleen and Liz coming up to sign the first discs for having tried out a segway! Finally, we also announced the Challenge Cup winner for this year! Which was Breda, who retained the cup for the second year running! Well done Breda! Now who is going to take up the challenge this year?! We will be joined by yarn expert extraordinaire, The Crafty Heffalump, who will be demonstrated some of her amazing yarn dyeing skills to us, plus we shall be running a Freshers’ Fayre so you can find out more about all of our sub groups. Finally we will get to see more of your creative sides with our Egg Dyeing Challenge Cup! 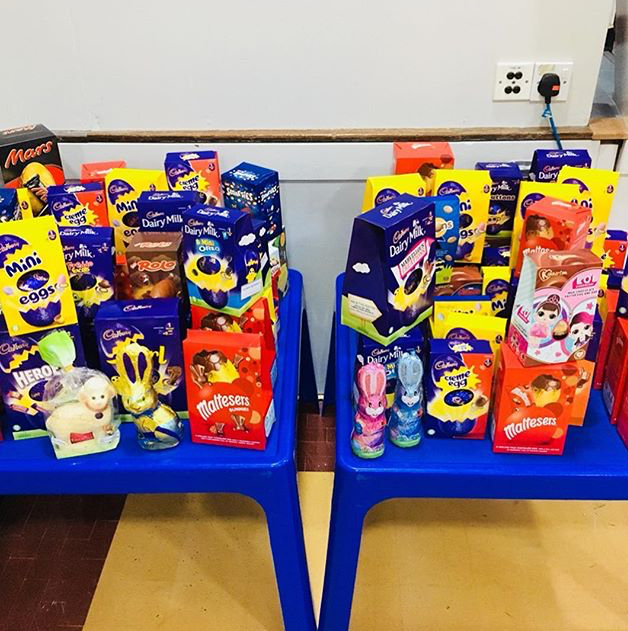 As per previous years, we shall be collecting Easter Eggs, at our March meeting, to donate to the women and children staying at Changing Pathways (formerly Basildon Women’s Aid) this Easter. Mini eggs, small eggs, large eggs – whatever you choose. This month we are joined by some of the team from Essex Wastebusters talking to us in conjunction with the WI’s Love Food, Hate Waste campaign, about leftovers and what we can all do as individuals. The Challenge Cup details can be found by clicking on the right – we’re hoping for some tasty recipes from you all! And we have our cookery themed Swap Table. Plus… and most importantly… we have new members joining us tonight! So we’re very excited to meet them! We were joined by the lovely Kirsty from Bedfords Park Walled Garden, which is is a community-focused food growing space on the edge of London. It also sits within a nature reserve and an historical setting. It was really interesting to hear about the work that they have done and all the changes they have achieved. And also about all the edible weeds, including Japanese Knotweed. A big well done to Top Three in our Challenge Cup photography contest. That was one awesome party Belles! We had such a fabulous time, learning to burlesque with Bunty Beauford-Brown. And to top it all she was an inspirational speaker with her not uncommon experiences of the self consciousness that women can feel, and how burlesque gave her the chance to get her mojo back. Just superb. And wow, didn’t you all go to some effort with the underwear! From flashing bras, to party popper bras to rock climbing up a pair of long johns to ring the bell nestling in the crotch! Brilliant too, to see Lesley’s home made mannequin bust. And it is great for the committee to see just how many of you actually use the website and the Facebook page. 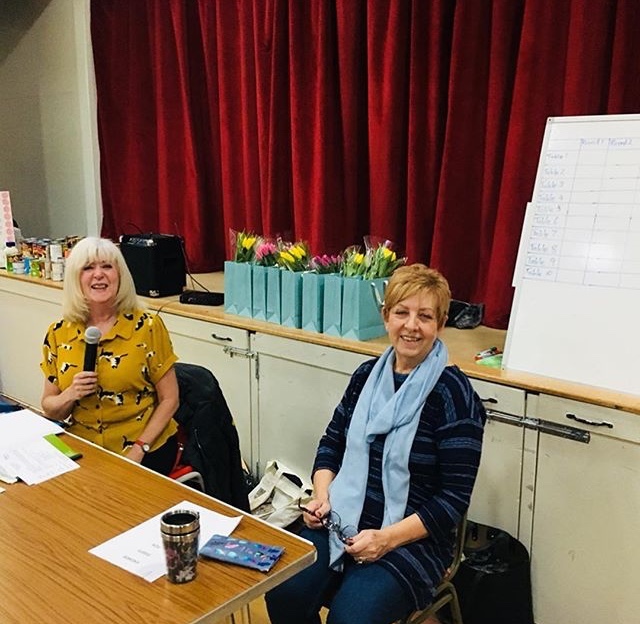 Carol and Marion report that trade was brisk for upcoming trips and additional tickets have had to be ordered for Hylands Park. So click straight through to the Tripping With The Belles page if you don’t want to miss out! We had a brilliant time with Sophie Biebuyck, and her hearing dog, Rusty. We heard Sophie’s inspirational story of how Rusty, her hearing dog, helped change her life. And Rusty was a superstar and lapped up all the attention. We also had our awesome home produce swap table which did brisk trade throughout the evening and was only left with a giant marrow at the end! And finally we had a bit of a Q&A with Jane, our President, about different ideas members had and how they could help out with welcoming our trial members this autumn. July was an awesome meeting. Very hot, but awesome! 30 degrees and little breeze in fact, according to the thermostat in the hall. However, we had the very chilled out and brilliant group, The Daisy Bowlers with us and so the evening sped by. It was also assisted with the inclusion of some rather yumptious scones and glasses of Prosecco. July’s Challenge Cup was Handmade Fans and our members didn’t let us down! The Daisy Bowlers kindly judged them for us on the attributes of waftiness and beauty! Well June was a corker of a meeting. We were joined by the lovely image consultant, Elaine Smith, and , fabulous make-up artist, Leanne Perilly, who showed us “Your Capsule Wardrobe and Make-up Bag”. We had a great time hearing from them and deciding how easily we could reduce our wardrobe to Elaine’s capsule size! Some great make-up tips from Leanne too. We were dressed to celebrate, in honour of H.M. The Queen’s official 90th birthday, and all our Belles looked amazing. June’s Challenge Cup was: “Wish You Weren’t Here!” – we asked you to bring your worst holiday souvenir and you didn’t let us down, especially with the skull! And here’s our three top entries, with Breda pipping everyone to first place again!